You already have your Open Water certificate (or an equivalent of the first level of diving), you have practiced scuba diving for a few times already, and you enjoy exploring the underwater worlds. Today you want to get more opportunities of diving. The Advanced Open Water course is the one you need. During this PADI course, you develop your skills, improve your buoyancy, go deeper, and you can learn more about aquatic life (fish, corals, behaviours). When you get this advanced certification, you get new options for exciting adventures, such as go diving in easy caves or wrecks, go night diving, go in dive sites with stronger currents, go deeper, consume less air and stay longer, get more knowledge about the marine life, etc. To get the Advanced Open Water certification, you will need to complete 5 PADI "Adventure dives" among a catalogue of 16. Among the large choice of Adventure dives, two of them are compulsory: the Deep dive, and the Underwater Navigation dive. During the deep one, you will go to 30 metre/50 foot deep, practice a few games down there, and get the good habit to check "no decompression limits" and pressure gauge way more often. During the navigation dive, you will use a compass, practice a few patterns with it, and orientate yourself according to some underwater references easy to identify. Since you need to complete 5 Adventure dives, you will choose 3 other ones with your instructor. In the PADI program, there are 16 different kinds of Adventure dives. In El Nido we can provide 10 of them. 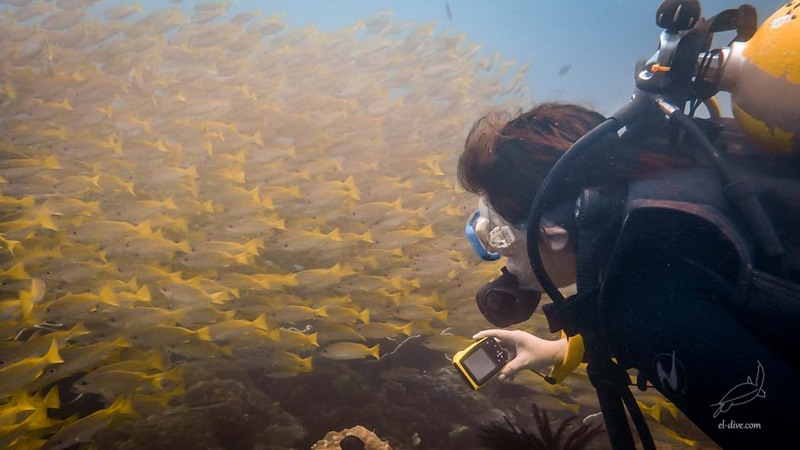 Among them, we highly recommend some of them, such as Peak Performance Buoyancy, Fish identification, Night diving (especially great between April and November), Underwater Naturalist, and Underwater photography (if you have your own underwater camera). Those are fun and very interesting. You learn a lot more about marine life, get aware of your environment, and improve your buoyancy, which is highly advisable if you plan to continue diving in the future. Adventure dives are a sort of introductions to Specialities. Therefore if you have already a Speciality, this one can directly be credited for one of your Adventure dive. For some people, diving from a boat can be a total new experience. In El Nido we use traditional boats during our dives. Learn the different types of entries (the giant stride, and the sitting back-roll), learn how to interact with the boat crew/captain when you plan your dive, get to know what type of safety equipment you need on the boat, etc. Dive with strong current is something that occasionally happens in El Nido. Your instructor teaches you how to behave and what to expect underwater. You need special equipment, and you plan your dive according to the current conditions. Imagine you loose underwater a tiny object such as a ring, or you need to look for a missing diver, or you need to lift up an heavy object to the surface. This is what you will learn during this Adventure dive.